UPDATE! I'm happy to say that I contributed this chili, the turkey version, to a chili contest at my church on Sunday, 10/12/14, and won for most unusual ingredient entry! The second batch of this came out just was well, if not better than the 1st! If you have a salt-free Mexican Seasoning mixture, use it! And again, do use the Goya Cilantro cooking base - it makes such a wonderful "sauce" for this white chili version. As soon as the Autumnal chill comes whipping through our house, I want to pull out the Dutch Oven and Slow Cookers. I also want to start cooking with beers and PUMPKIN - in just about everything! I was in the mood for chili, but I'm tired of my usual version, with a tomato base and tons of ingredients. It may be cooling off around here, but it's not yet time for a heavy hearty chili. Instead I made a batch of white chili, using a Goya Cilantro as my base, along with posole, two kinds of white beans, and a lot of vegetables. I made a portion of this totally vegan/vegetarian, so I could have it for work. The rest I added browned, lean ground turkey. Both versions were fantastic, and truly, the meat wasn't necessary, I just wanted it. I served this with a quick doctored batch of box corn muffin mix, to which I added pumpkin. Pumpkin really is the flavor of the season! Actually, pumpkin has very little flavor, it's the nutmeg/cinnamon/clove/ginger mixture that is the flavor we all think of as pumpkin spices. Onward with our recipe. Use low-sodium, high quality canned beans if you are using canned beans. Drain and rinse them - to remove more of the salt. I love the Goya Recaito Cilantro base - it's super low in sodium and adds a nice base of flavor quickly. Made from a puree of onions, garlic and cilantro. A bottle of a nice pumpkin style ale if you desire. We had Sam Adams on hand, but any pumpkin ale that you enjoy drinking is what you need to use. Saute the vegetables in batches so things cook evenly and develop their flavors and caramelize. There's a reason to the order of cooking the vegetables - some cook faster than others. I used a vegetarian version of Jiffy Corn Muffin Mix (which means it had no lard in it!) and added 1/2 cup of pumpkin puree to the mixture. 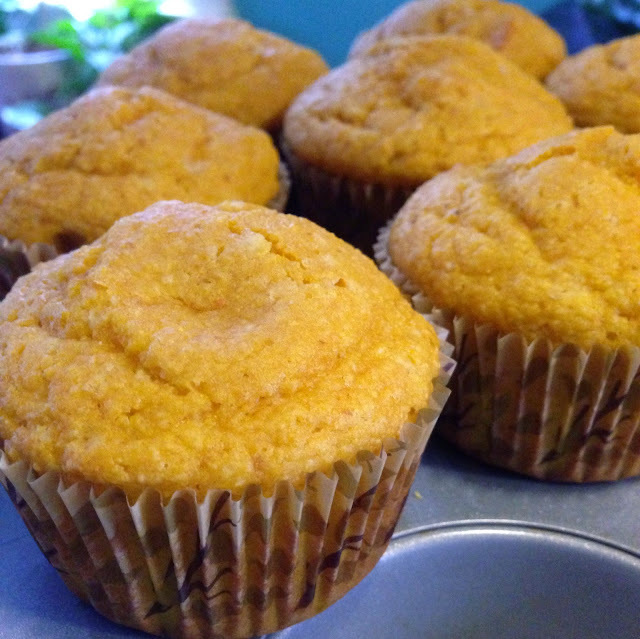 It made the muffins very moist and kept them tender and fresh tasting for days! Cut the vegetables into even sizes - about the size of the beans - so that would be on the small-medium dice size. 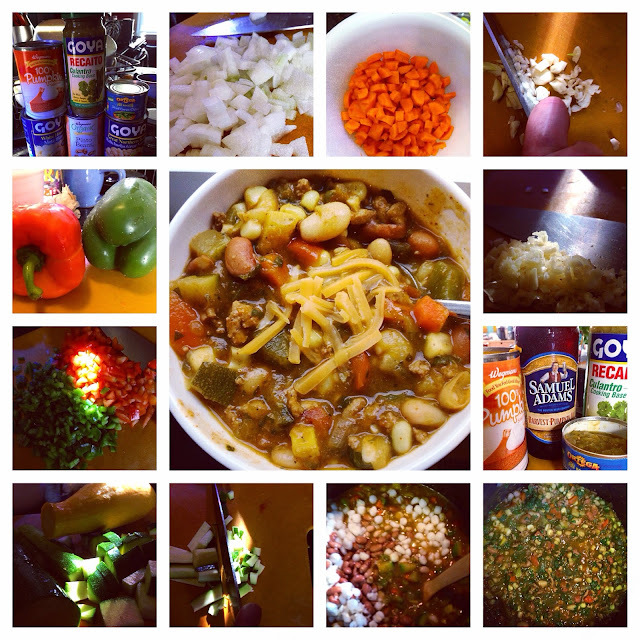 This chili doesn't need to cook all day - about 2 hours max. Note that it will taste much better the next day once it has a chance for all the flavors to marry together. Most ingredients can be found in the Mexican Foods aisle of your supermarket. Use a stock pot, Dutch oven or other large and heavy bottomed pot. Heat 1 tablespoon of olive oil until it shimmers over medium-high heat. Add in the onions and the carrots; saute and sweat them about 8 minutes, or until they begin to take on a hint of color. Add in the garlic, stir and cook another 3 minutes. Add the peppers, the squash and zucchini and saute for 5 to 8 minutes minutes. Next add in all of the dry seasonings, cumin through thyme and stir to combine and toast. Add in the beans, pozole, frozen corn, cilantro base, diced chilies, pumpkin puree and beer and water. Stir to combine. Bring the mixture just to a boil, then reduce heat to low and simmer, 1 to 2 hours. Taste and adjust seasonings, adding salt and freshly ground black pepper as needed; adjust as needed additional cumin, chili powder or oregano Stir in the lime zest and juice last, to brighten the flavors and stir in the freshly chopped cilantro. Makes about 1 gallon of chili or enough to last several meals and freeze some. Frozen, it will last for up to 4 months. Serve hot with cheese, sour cream, tortilla chips or with brown rice, if desired. ADDING MEATS: If making this with the ground turkey, or any ground meat of choice, brown the meat in a separate pan, and season lightly with pepper and and some of the Mexican seasonings so that the meat has a layer of flavor. Don't add any salt, there will be enough in the final dish. Drain off any fat and water, and then add to the chili pot along with the the liquid ingredients. 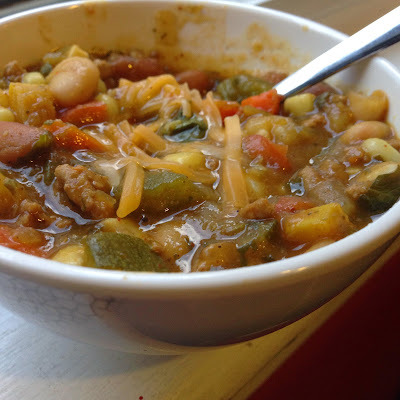 Notes: If you want to add bulgar wheat to this to bulk up the chili, add 1 cup of bulgar wheat it when you add in the liquid ingredients, along with an additional cup of water. As the bulgar wheat cooks, it will absorb the liquid and more than double in size. If the mixture is too dry, add in additional water, by 1/2 cup at a time. Remember to stir the mixture to keep it from sticking to the bottom of the pot. This recipe does use a few canned products, beans, pumpkin, cilantro base, diced chilies. You can make things from scratch, but in all my years of massive cooking, it really is okay to use canned products so long as you know the salt/sugar/fat contents of each and realize how quickly it will add up in the final product. Posole, is a lime and salt soaked dried corn product. It's a very Mexican ingredient and adds a quirky and wonderful texture to the chili.